Answer to your question: Which way do my lead wires go? Does it matter which side of the guitar pickup that the lead wires exit? Does it matter which way I point the lead wires when I install the guitar pickups? Do the lead wires have to be oriented out of the same side for both guitar pickups when I install them? Generally speaking, the direction the lead wires come out of the pickup has no bearing on guitar pickup phasing. You can rotate the pickup left or right (clockwise or counterclockwise) and it will not matter. The only time left and right orientation comes into play is with staggered pole pickups, and even then there are people that use a reverse from normal stagger. The only way phasing could be affected is if you installed the pickup completely upside down, which would reverse the phase. In other words, accidentally installing a guitar pickup with the pole pieces pointed into the guitar cavity. But this seems highly unlikely – this would mean the base of the pickup would be pointed toward the strings. 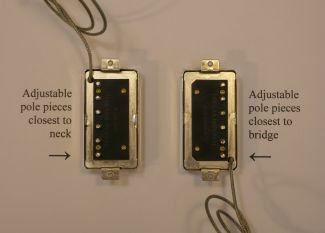 The misconception that the lead wires need to come out of the “same side” of the pickup most frequently comes up when customers are installing humbucker pickups. If you take a look at this photo, you’ll see that the lead wires are coming out of “opposite” sides of the pickup. This will happen if you are installing your humbuckers in the “conventional” way. That is, installing them with the adjustable poles of the neck pickup sitting closest to the fingerboard, and the adjustable poles of the bridge pickup sitting closest to the bridge. Our recommendation is to install the guitar pickup with the lead wires oriented whichever way installs the best, easiest, or most conveniently oriented toward the control cavity. Also base your decision on what goal you want to achieve, as with the humbucker example.